This course is for those who are just opening Maya for the first time, or those still getting started with it. Students will learn everything from the basic layout of Maya, basic tools for working with mesh, basis for adding shadows and unique lighting effects to your model, and step-by-step tutorials for making a simple cookie jar, an old lounge chair, and a sword, and uploading to Second Life. Each lesson is designed to get users familiar with various tools and learn a variety of techniques to approach polygonal modeling. 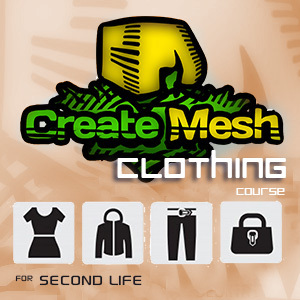 This course covers everything you need to get started with modeling clothing for Second Life. There are in-depth tutorials on how to construct basic pieces of clothing to fit well around an avatar, how to set up the UVs and texture each with proper lighting and shading effects, and extensive strategies for rigging it to a skeleton and how to paint weights for your model that will make it move smoothly with your avatar in Second Life, including use of the Interactive Skin Bind features in Maya 2011 and later. 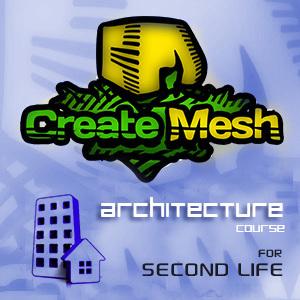 This course will focus on everything you need to know to get started with architecture in Second Life, including how to make a low-poly/low prim model, making a model with multiple faces in Second Life, efficient use of texture space by Overlapping UV shells, unique lighting effects, making custom Levels of Detail (LODs) and how to make a physics/collision model to allow your avatar to walk through your build. 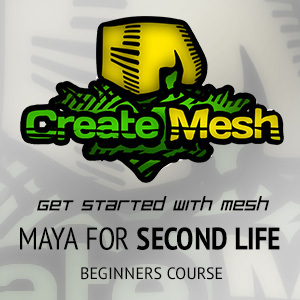 The Introductory Megapack includes all the videos from the first three courses for using Maya to make mesh in Second Life. This will teach everything from just opening Maya for the first time to making elaborate architecture with custom lighting effects to rigging skin weights for detailed pieces of clothing, and how to do it all as efficiently as possible. Who is involved in its creation? Owner and Founder of Lenox Clothing, a mainstream clothing brand. Owner and Founder of Rochambeau, since 2009, critically acclaimed and trend-setter in sim building, textures, fantasy apparel and accessories. Designer and consultant for Primus Weapons. I had to spend years digging through forums and tutorials to scrape together everything I needed to know to design mesh for Second Life. I started off building with prims and sculpts in 2008, and now I am able to design for other PC games, iPhone games, anything. Has been making free tutorials for designing for Second Life for years, and personally helped numerous other designers become successful shop owners in Second Life. Experienced in Autodesk Maya, Blender, ZBrush, Mudbox, Photoshop. Owner of AC Creations. Entrepreneur, developer, designer, online marketing expert. Creator of the most popular in 2007 AC weapons. Sold copies of them for more than 17,000,000 LD. Creator of a 3D iPhone game for iOS which stayed 3 weeks as No.2 in Apple Store US and was downloaded 2 million times. Currently developing systems for online marketing in Web or SL and three online education platforms. Owner of Primus Weapons. Entrepreneur, leading business owner, developer, designer. Creator of the leading and biggest weapon brand in SL until today. His store has hundreds of top quality products, which combine the use of top notch design and scripting. His brand is No.1 in its niche for the last 6 years. To endure the evergrowing and ever-changing environment and to compete in the worst of the worst highly competative niches, to establish a raving fanbase of thousands, I had to research daily and improve my products in two ways for over 6 years - designing them with cutting edge technologies and scripting them with just released LSL features. 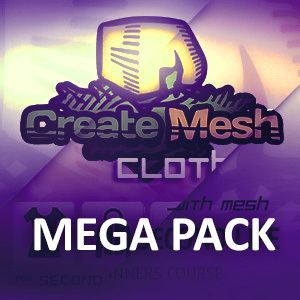 Create mesh courses grow and change to adapt to your taste. Whatever you need to become successful with your brand, you will find it here. But Create Mesh is not just a set of online courses. It is a growing community of leading designers, developers, brand owners, who share business opportunities and bleeding edge technologies. We mediate between you, to make sure that your opportunities for collaboration grow and empower your brand.